In MIT speech, Senator Sanders contends future of U.S. politics "must be progressive." 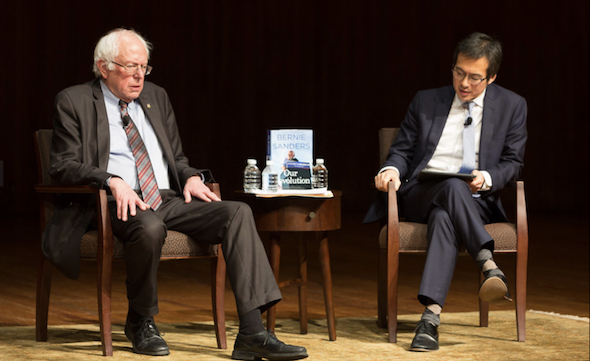 A Q & A session moderated by Archon Fung BS ’90, ’PhD 99, academic dean and Ford Foundation Professor of Democracy and Citizenship at the Harvard Kennedy School, followed Sanders’ presentation. Vermont senator Bernie Sanders made a forceful pitch for his progressive political vision in a talk at MIT on Friday evening, asserting that U.S. politics “must be” liberal in nature if the country is to surmount its economic and social struggles. “In the country today, there is a lot of desperation and fear and anxiety about what is going on economically,” Sanders said, noting that the top one-tenth of 1 percent of Americans has as much financial wealth as the bottom 90 percent. To counteract that, Sanders argued, the country should implement a series of progressive measures: a single-payer health care system, the removal of large money donations from politics, and a complete overhaul of the energy production system, among other things. “The future of this country will be and must be based on a progressive vision,” Sanders contended. Those policy ideas, to be sure, are measures Sanders himself backed vigorously during his surprisingly successful 2016 presidential campaign. Sanders’ candidacy, initially expected by many observers to be an electoral afterthought, gained traction with voters for months and helped reveal how deeply economic stress has affected the middle and working classes in American society. Full story at MIT News.